Team Ireland manager Philip McCullough bemoaned the luck of the Irish after hearing about the injuries sustained by Graeme Irwin. The Carrick man, his number one MX1 rider, had broken his scaphoid and dislocated his right wrist after crashing on lap one of race two at the final MXGP of the season at the Imola circuit in Italy on Sunday. “They talk about the luck of the Irish, we haven’t had any so far with injuries to Stuart Edmonds and now Graeme,” said McCullough. McCullough, who competed seven times for Team Ireland at the MXON is still convinced that if the team perform to their potential and they have that all important little bit of luck anything is possible. McCullough himself had a best finish of 11th at Nismes, Belgium back in 1997 when he was riding a 125cc Kawasaki for Edward Allingham of EHA racing, has his sights set on a top twelve finish for the team despite loosing Irwin. “This is a massive blow for myself, not just on track, but to the team also as Graeme brings so much experience and charisma with his never give up attitude and outgoing personality,” he said. “He is ‘gutted’ and along with myself, Martin (Barr) and Richard (Bird) will sorely miss his influence both on and off the track as we make final preparations before flying to the USA. Reserve rider Gary Gibson was surprised yet delighted for the opportunity to race in the Irish team for the MXON. The 30-year-old originally from Ballygowan but now living in Northamptonshire is no stranger to the ‘Nations’ having been part of Team Ireland in 2013 when they raced in Germany. This year he raced for the TMC/LTR Kawasaki team finishing third in the AMCA British championship and fourth in the European Championships. Graeme Irwin finished 20th in race one before crashing out of 19th place in race two. 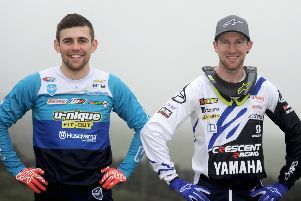 He flew home on Monday to have the injuries operated on but is devastated at missing the MXON. He said: “What can I say, my bad luck continues. I was so looking forward to the ‘Nations’ then this. Obviously I wish the boys the best of luck and I wish I was there, racing with them.” The sole point gained in Imola was added to the local rider’s tally and ensured 26th in the World championship ranking. Ballyclare’s Martin Barr is also relishing the America challenge. The local rider has had a difficult end to the season on the Revo Husqvarna. After leading the European championship in the early part of the season bad luck ruined his late season title charge with him having to settle for fourth in the series. Barr on his day is a match for anyone and now with Irwin out he will lead from the front. Barr can draw on his vast experience at the MXON having competed at 14 consecutive ‘Nations’ and has the ability to lead the team to that coveted top ten. “Obviously I’m gutted for Graeme,” he said. “An injury at any time is frustrating but a week before the biggest event of the season is devastating. Motocross is one of the cruelest sports in the world but he will bounce back. Gary is no slouch and has been there before and knows what it takes at this level. He’s been racing all year and like us all will be going there and give it 100%. “Obviously I am looking forward to it. This will be my fourteenth consecutive motocross of nations and the third time racing in America. Hopefully we can go there as a team and get that top ten. It’s definitely on the cards. It’s not going to be easy but we are going to go there and give it our best shot.”. Richard Bird was drafted into the team after Stuart Edmonds got injured and he couldn’t be coming to the event in better form having just completed a memorable season where he was crowned MX1 Ulster, Irish and British Experts champion on the Five5 Motorsport KTM.